We may be looking at the sizes of new trio of Apple smartphones for 2017 thanks to a few pictures of molds. 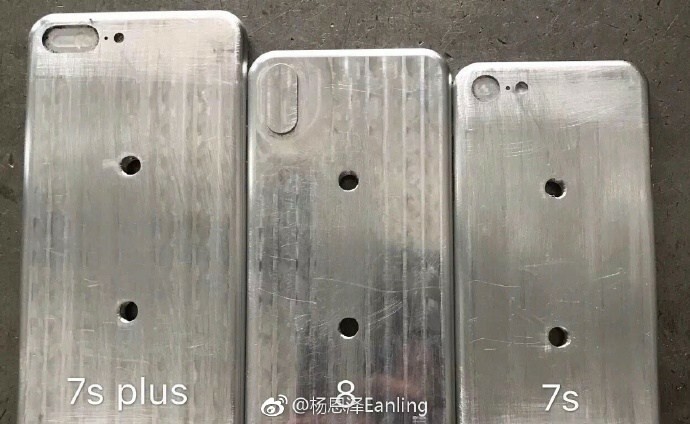 While the molds don't really offer up any new information they do show the expected size difference between the iPhone 7s Plus, 7s and iPhone 8. The Apple iPhone 8 - in the middle - with a rumored screen diagonal of 5.8" is slightly wider and taller than the iPhone 7s (expected to have a 4.7" screen) and narrower and shorter than the iPhone 7s Plus (probably 5.5"). Another interesting bit is the vertical dual camera, we've already seen on a purported dummy iPhone. Rumor suggests that Apple will move to a vertical setup due to the narrower body of the new phone. 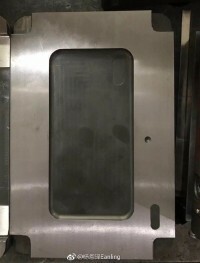 Usually molds like this are used by case makers to tailor accessories for an upcoming device. 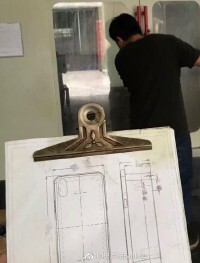 This means the dimensions and cutouts should reflect the real phone. Apple could unveil the iPhone 7s and 7s Plus, similar in size to the current 7 and 7 Plus, alongside an anniversary iPhone 8 with an OLED screen and 3D-sensing front camera. The iPhone 7s and 7s Plus will reportedly launch earlier with the iPhone 8 due for a late October release in limited quantity. While the rumor mill has been focusing on the iPhone 8 only, it's expected that the iPhone 7s and 7s Plus will carry a similar design to the current flagship duo but will have glass backs instead of the current aluminum. lg and samsung are notorious for copying - it is the korean way after all. They came out with tall screens because apple went to them to supply tall screens for the iphone 8 months in advance.